The Lib Dem team have welcomed the recent installation of a ticket machine on the car park side of Gatley station, after a long campaign. 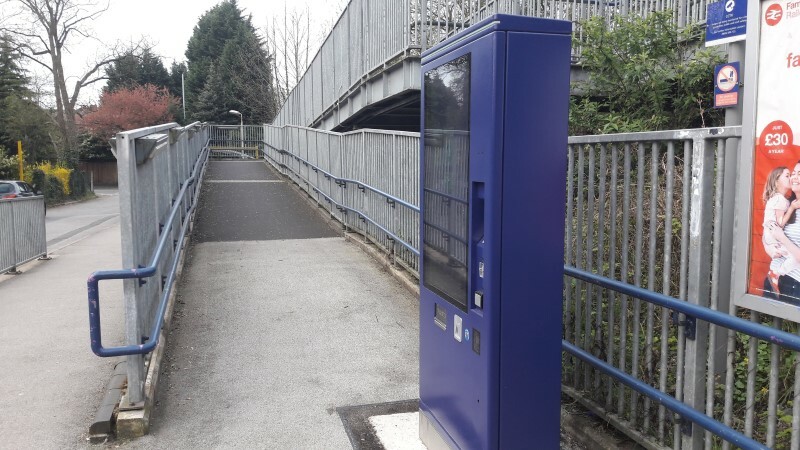 “There are many problems that need sorting out with our rail service, but getting a ticket machine by the station car park is welcome and ticks one issue off the list,” said Cllr Graham Greenhalgh. The Lib Dems have been campaigning for the new ticket machine for some time. “It never made sense that someone going to Manchester Airport or Crewe had to come to platform 1, perhaps with heavy cases, buy a ticket and then go all the way across to platform 2. That’s now sorted,” Graham added. The Lib Dem campaigns for a rail service to Cheadle and for an improved timetable for Gatley continue. Why is it not undercover, are users of public transport expected to stand in the rain to get a ticket. Had that been a problem for you Roy? We’ve not had any other complaints about it not being sheltered, but happy to follow it up if it’s an issue for people. We live in the North of England an area that is great but we have plenty of rain, I would have thought that providing shelter at a ticket machine would have been obvious, and would not have needed complaints from the travelling public. Whilst on this subject could we get the drains sorted on Gatley Road especially at the junction with Kingsway so that people walking to the station in wet weather can do so without getting drenched by cars driving through flooded gutters. Hi Roy – as I say, happy to raise it if people feel its an issue. I use the station in Gatley regularly and most people choose to not to stand under the shelter most of the time, so it isn’t one that I would jump to conclusions about. When we spot blocked drains we report them to the council via the website. We try to get out and spot them, but we do rely on residents too. If you spot a blocked drain, please either report it to the council or to us (letting us know where the blocked grid is).